The International Foundation for Electoral Systems (IFES) has developed a new assessment framework to identify intersectional barriers and opportunities related to political participation of people with multiple social identities, such as gender, disability and age. This methodology seeks to generate focus group data through democratic, collaborative, and participant-led means. Participants may be asked to work in groups to identify and present key information that they then analyze, categorize and prioritize in different ways. Participants may also be asked to take open “votes” on opinions and priorities that are immediately tabulated and visualized to guide open discussions on results. This methodology emboldens even the quietest of participants to think for themselves and voice their opinions, as opposed to more traditional group interviews where a handful of participants may monopolize the conversation. The result is a rich mix of qualitative and quantitative data, and a preliminary, stakeholder-led analysis of the information gathered. In many countries, marginalized populations, including women, persons with disabilities, LGBTI persons and people from ethnic or religious minorities experience systemic discrimination, and in some cases, physical or psychological violence that undermines their political rights. Although barriers to political participation by discrete marginalized groups are often well-documented, there is virtually no analysis of the intersecting challenges or common goals between the actors in each area. The intersection of different social identities compounds barriers to meaningful participation; however, how such barriers manifest at individual and societal levels is not fully understood. The IFES Intersectionality Assessment Framework is a participatory methodology that can be tailored to focus on different aspects of political participation, such as leadership, political violence and access to elections. The methodology allows people who identify with multiple social identities to share ways they currently participate civically and politically, prioritize identified solutions to barriers, and share their opinions in a targeted survey. The framework also involves key informant interviews with relevant government and civil society stakeholders. 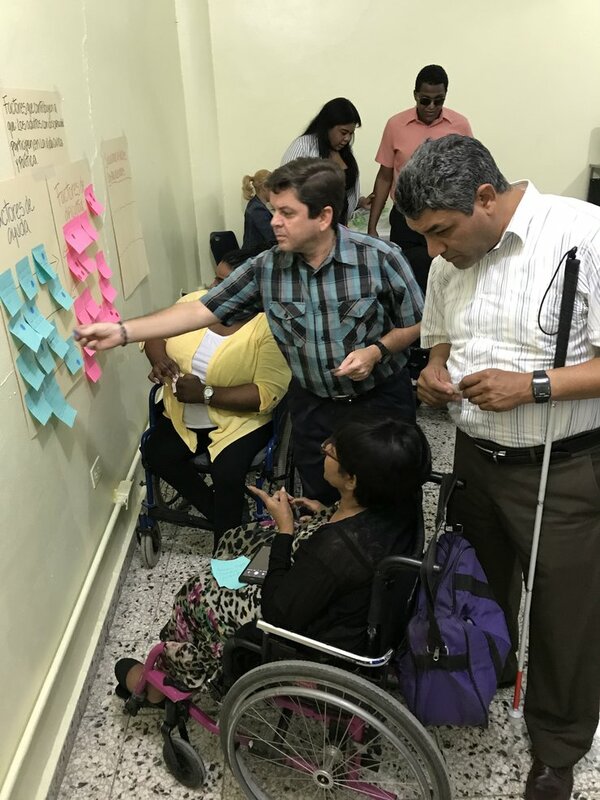 With U.S. Agency for International Development support, IFES piloted the framework in January 2018 to gauge barriers to political leadership for youth with disabilities in the Dominican Republic. An assessment report will be published this spring highlighting findings. Results indicate that youth with disabilities experience legal, physical, attitudinal and informational barriers to participation in political life. These barriers are compounded for young women (with and without disabilities) who also encounter barriers resulting from societal norms that inhibit their participation in political life. Interestingly, youth without disabilities identified nepotism and clientism as the main reason they do not participate more actively in political life, whereas youth with disabilities did not mention this issue. Young men and women with disabilities were less likely to identify themselves as a leader in their community compared to adults with disabilities and young people without disabilities. These findings will be used to develop a tailored leadership curriculum that will be implemented with Dominican youth with disabilities this summer. The Intersectionality Assessment Methodology is currently being contextualized for use in Armenia with a focus on political engagement of women with disabilities and will be trialed again in Tunisia in May 2018, with a focus on women with disabilities and people with low literacy. IFES will refine the methodology based on learning from these pilots in Latin America, Europe and North Africa.